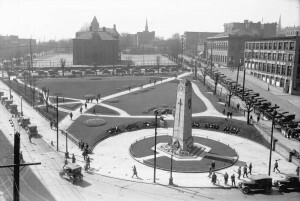 Figure 6.6 Beginning in the 1920s, “cenotaphs” began to crop up across Canada to memorialize the fallen of the Great War. Vancouver, ca. 1924. The British historian, Arthur Marwick, contributed to the study of 20th century war a model for assessing its impact. “Total war,” in military terms meant targeting factories and food production, and not just enemy armies. It meant, in that regard, that civilians who were supporting the enemy were legitimate targets as well. This was a change in military practice, especially in terms of the scale of casualties and damage that industrialized forces could inflict. Marwick took this understanding of war and modified it so that “total” described the engagement of the whole nation in the conflict. Whether manifest in rationing, industrial employment, limitations on civil freedoms, or its impact on culture, 20th century wars have swept along far more than armies and munitions plants, even in Canada. Marwick’s Principle looked at the changes wrought by war and measured them in four ways. First, there is what he called the extent of destruction involved, which can include the burning out of factory machines, the loss of productive capacity, and very definitely the loss of human life and ability. Second, there is the level of “participation” in a wartime society; Marwick pointed to instances where participation increases (women working in factories, getting the vote) and where it decreases (foreign-born Canadians thrown into internment camps), although he mainly shows how going through that change in participation levels can result in post-war changes in engagement, too. Third, and this pertains very definitely to the enormity of the human waste involved in industrialized warfare, there is the psychological impact, including the ways in which it challenges pre-war ways of thinking. Finally, there is war as a “test.” Total war is a crucible through which armies and ideas, systems, and values pass. Some survive intact, others prove wanting and are either reformed or they are allowed to die away. How did Canada fare in its first Total War? 61,000 Canadians dead. Over 170,000 wounded. Newfoundland contributed an additional 1,305 dead and still more casualties. Twenty Canadians were shot by firing squads for the crime of desertion and another 180 condemned men were spared execution. There wasn’t much glory in this conflict, although Canadians seized upon the victories at Vimy and Passchendaele as symbols of national maturation, a culture of toughness, and indefatigable resolve. Certainly, the armed forces were forced to grow up. The militia-based model that Sam Hughes championed from 1911 to 1916 gave way to a more professional version. Borden promised grateful Britain 25,000 troops in the summer of 1914; by Armistice there were more than 600,000 men and women enlisted. The fact that this took place under the auspices of the War Measures Act is significant. Canada went to war to defend liberal democratic values against what was characterized as a dictatorial Prussian militarism and, along the way, Ottawa stripped civil liberties from many, directed the militarizing of much of the economy, and introduced compulsory service. Also, income tax was introduced as a “temporary measure.” Elements of the growing role of the state could be seen, as well, in the economy as Canada’s modest demand-led economy gave way to a command-led model, in which the state became the principal client of manufacturing. Able to influence the flow of raw materials and to specify the character of output, Ottawa built up what it regarded as the essential sectors while implicitly starving others. There was, by war’s end, a Royal Canadian Navy (albeit a very small one). Canadian fighter pilots distinguished themselves in the air — most notably William “Billy” Bishop (with 72 victories) and Raymond Collishaw (with 60) — and thereby established the foundations of a Canadian Air Force. By 1918, errors made by British leaders in London and in the field also contributed to a stronger sense of a Canadian identity. The trade depression that began in 1912 showed no sign of recovery by the end of 1914. Had the war been as brief as touted in the press and by politicians, the economy would have hardly felt its impact. Through 1915, however, demand for production increased, soldiers in the CEF created job opportunities as they departed for the Western Front. By 1916 the search for workers meant that women, in particular, were finding employment in factories and offices. Internment camps for “enemy aliens” were used to contain recent immigrants whose loyalties were questioned by xenophobic Canadians. Some were opened in the Rocky Mountains, where internees spent the war building much of the campsite infrastructure of the national parks. Given that most of the internees were drawn from a population that had been in Canada less than twenty years, their detention can be seen as an expression of nativism and an indication of just how thin the Canadian welcome mat really was. Aboriginal people’s participation in the war has also attracted comment. As Scott Sheffield writes, “First Nations that historically honoured warriors viewed the conflict as an opportunity to reinvigorate such traditions.” (See Section 6.12 below.) Aboriginal Canadians were welcomed into the ranks and some 200 Chinese Canadians volunteered and were accepted for service. In sharp contrast, African Canadians were not permitted to serve. Voluntarism was possibly the most profoundly polarizing issue for Canada from 1914-1918. Initial enthusiasm saw Borden’s request for 25,000 troops surpassed by another 10,000 volunteers. As a proportion, English Canada was over represented. Given the long-standing, inward-looking nationalism of Quebec’s most prominent statesmen, English-Canadians assumed that French-Canadians generally were cool on the war. There was some measure of truth to this. While many English-Canadians could be rallied, from time to time, with calls for loyal support of the Imperial homeland, French-Canadians were typically less enthusiastic (Laurier’s “ready, aye ready” notwithstanding). Nor did French-Canadians have a profound affection for France. One hundred and fifty years had passed since the Conquest and more than a century since the French Revolution. The status of the Catholic Church and clergy in France was very different from its position in Quebec, something that Canadien priests had been pointing out for the whole of the 19th century. The whole ultramontanist movement in Quebec was a rebuke to French secularism. German attacks on France, therefore, did not automatically strike a deep chord of sympathy in Quebec. The strong nationaliste strain in Quebec was opposed to supporting Britain’s war. What’s more, it could point to intolerance in Ontario as something worth fighting that didn’t entail going overseas. Ontario introduced severe limits on French-language instruction in 1912-1913 with Regulation 17. Borden managed to deflect responsibility to the provincial level where even the Irish Catholic bishop was siding with the Anglo-Protestants to end French instruction. French-Canadians were outraged and the Quebec MPs in Borden’s caucus pleaded with him to intervene. Huge delegations descended on Ottawa to the same end. Borden could reasonably (and probably correctly) claim that the constitution was clear that education was a provincial matter. What’s more, Laurier’s experience with Manitoba could be invoked: attempting disallowance was likely to be fruitless. But Laurier’s actions suggested, too, that there was room to pursue negotiation and to plead for some symbolic act of generosity from the provincial legislature in Queen’s Park. The Franco-Ontarian minority was alienated from the Tories as a result of Borden’s inaction but their votes counted for little. Regulation 17 had wider consequences, though. Had the issue been resolved by August 1914, Regulation 17 might have been of little consequence, but it festered well into 1915 and kept crawling out of its grave in the 1920s. It turned feeling in Quebec very sharply against Ontario. Québecois disinterest in military voluntarism and hostility to conscription may not have been shaped by Regulation 17 but it was certainly scented with it. When, in the course of the Great War, attempts to amend the law met with unyielding resistance from Anglo-Canadians, Henri Bourassa decried the “Prussians of Ontario,” a reference to the German enemy. What values, then, would a Québecois volunteer be defending in the CEF? This question was asked by French-Canadians who saw Anglo-Canadian aspirations for autonomy and true national status as bound up in intolerance and assimilationism. Setting all that aside, English-Canadian voluntarism deserves a second look. The two decades before the war witnessed huge migrations of British men and women to all parts of Canada. They were vastly over-represented in the ranks of volunteers in 1914-16, just as they are in the list of “Canadian” Victoria Crosses. It goes some distance to explain why British Columbia – with only 5% of Canada’s population – contributed 10% of its war dead. Once the excitement of August 1914 had dissipated and once it was clear that the “boys” would not be “home by Christmas,” Canadian-born English-Canadians coast-to-coast demonstrated a level of voluntarism that was roughly comparable to that of French-Canadians. Some could legitimately claim to be part of the essential industries that fed a total war campaign: farming, factories, and transport. Maritimers — who had few factories on which the war effort depended — were particularly unwilling to join up, which may suggest that deeper Canadian roots were hardest to pull up. English-Canadians who resolved not to be drawn into the war were often targeted as cowards. Shaming campaigns were part of the recruiters’ arsenal and there were instances where white feathers — symbols of cowardice — were handed out by young women to men of service age who were reluctant to join up. None of this — not the statistics nor the campaigns of shame — served to diminish attacks in the press on French-Canadian “disloyalty.” With an army of half a million, and no more than 13,000 of them francophones, the issue was bound to attract attention and it poisoned relations between Anglo- and Franco-Canadians for decades. Figure 6.7 Women from Africville walk towards Halifax on Campbell Road, days after the explosion of the SS Mont Blanc in Halifax harbour on 6 December 1917. Figure 6.7 The explosion of the SS Mont Blanc in Halifax Harbour on 6 December 1917, cost 2,000 lives and 10,000 injuries. The ship was carrying munitions when struck at low speed by another vessel, caught fire, and produced the largest pre-nuclear explosion on record. 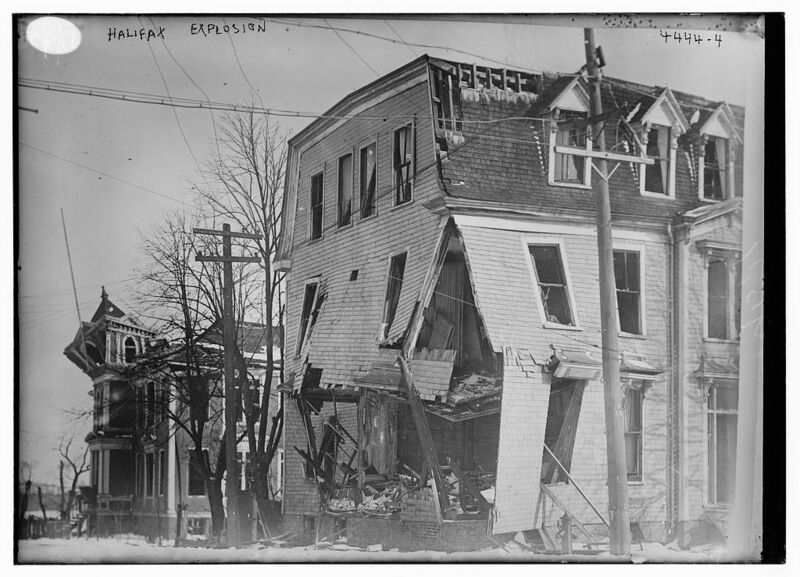 Windows throughout the city were blown out and much of the centre of Halifax was levelled. War profiteering was another divisive feature of the war years. Corruption was rife. It dogged the career of Sam Hughes, whose teetotal morality was in sharp contrast to a caustic and bullying approach to colleagues and staff. His defense of the Ross Rifle — fine for target shooting but useless if fired repeatedly — was more about Hughes’ preference for Canadian manufacturers than it was for military utility. Hughes followed a well-documented practice of securing posts and contracts for friends and families. His son-in-law was one beneficiary but the worst revelations came in the munitions scandals of 1916. These were errors on which the opposition and the labour movement both pounced. In November 1916 Borden obtained Hughes’ resignation. Comparing levels of deference from one generation to the next is always fraught with problems. The environments in which one group defers to another change and so the sentiment may no longer be relevant. Having said that, several changes in the mindset of Canadians took place between the Edwardian years of Laurier and the roaring twenties. Canadians’ understanding of the state was profoundly changed by the war. The War Measures Act enabled far more direct and widespread intervention by Ottawa than had been the case before. Some of this was decidedly temporary but it exposed the possibility of state participation in the economy and in social welfare. 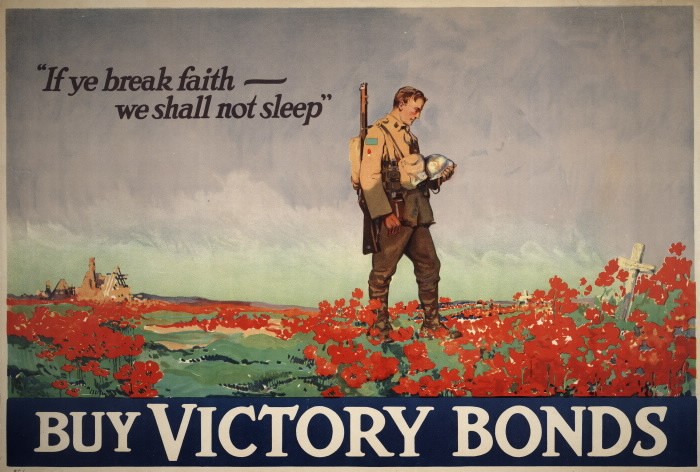 At the end of the war Ottawa owed $2 billion — almost all of it to Canadians who had purchased Victory Bonds. The beginnings of the welfare state could be seen in 1918; in the 1920s veterans’ widows and veterans themselves would receive some state monies while, at the same time, mothers’ allowances made an appearance. Figure 6.8 John McCrae’s poem was first published in December 1915 and, to use a 21st century phrase anachronistically, it went viral almost immediately thereafter. Here, two lines are deployed in the service of Victory Bonds. Canadian anticlericalism — the belief that the church and state should be kept at arm’s length — was always tempered by a loyalty to the congregation, sect, denomination, and chapel. Religious affiliation was, to Victorians and Edwardians, as powerful a representational quality as team sports would be in the late 20th century (see Sections 10.6, 10.16, 10.17). Religion provided a sense of belonging and community, and a common language of hymns and rituals. The Great War tested to destruction the faith of a great many Canadians (and others) and opened the possibility of seeking spiritual succour through newer and more dynamic evangelical creeds. The rising popularity of spiritualism before the war picked up momentum and delivered into the 1920s a generation that was prepared to explore eastern religions, other faiths, and the possibility of communication with spirits. William Lyon Mackenzie King, Canadians learned long after his death, was but one of many highly-placed Canadians who hoped that spiritual mediums could do for the dead what the telephone did for terrestrial voices (see “Mackenzie King’s Secret Life” in Section 9.5). Patriarchal values did not collapse but they were sorely challenged. Women’s increased economic independence, their experience of employed work in factories (and in the public sphere generally during the war) all contribute to the creation of what historian Veronica Strong-Boag describes as girls and women of the “new day.” The war inflated the incidence of widowhood in the interwar years; single mothers were commonplace in a way that they had not been in Laurier’s day. This meant, of course, that orphanhood — the loss of at least one parent — was more widely experienced by Canadians whose fathers perished in combat or at sea. It is true that the business world was effectively closed to women and that the doors of politics were open only a crack, but the need to find work and the need to find workers in the growing economy of the 1920s was bound to change women’s experiences and challenge the pre-war beliefs about the pater familias. The war changed labour’s relationship with elites in several countries. In Russia, this produced revolutionary communism. Western nations had good reason to fear that it would not end there. In the Victorian era, Canadian militia units were dominated by affluent young men who could afford the time to play soldier. The trenches of France and Belgium, however, were filled with farm boys and wage-labourers whose lives were sacrificed wholesale. The commander of the Canadian corps at Passchendaele, Sir Arthur Currie, demonstrated a chillingly accurate assessment of what victory would cost when he estimated that it would require 16,000 Canadian lives; he overestimated by 346. The scale of sacrifice demanded of this new kind of conflict threw into question class assumptions that had evolved through the industrial revolution. For some, a more democratic society — in the sense of one that was less hierarchical and automatically deferential — was what was called for. For others, nothing short of a social and political revolution was in order. Farmers, long the bedrock of Canadian political parties, broke with the Liberals and Conservatives and formed their own parties (see Section 7.9). If the institutions of state, church, household, and industrial capitalism were challenged in ways that are sometimes difficult to measure, the tone of Canada’s relationship with Britain was much more visible. From Borden’s demand for greater input in war planning, through the Imperial War Cabinet, the Balfour Declaration of 1926, and the Statute of Westminster, 1931, the trend toward greater national autonomy and independence was clear. It is difficult to imagine Laurier in 1906 insisting, as Mackenzie King could in 1926, that Canada was equal in status with Britain. Nor would Mackenzie King declare in 1922, as Laurier did a mere decade earlier, that the call to support Britain in the Chanak Crisis found Canada “ready, aye, ready.” Canadian affection for Britain — strong, weak, and mixed — may not have changed but deference to Mother England was no longer an easy pill for any but the most ardent Imperialist to swallow. The writer Lucy Maud Montgomery was troubled by the changes she saw taking place in Canadian society as the war marched on. On 17 June 1916 she wrote, “Our old world is passed away forever — and I fear that those of us who have lived half our span therein will never feel wholly at home in the new.” Canada was in many ways changed by the war. Rank British imperialism gave way to a distinctive Canadian nationalism; women’s roles changed as they moved into the public sphere and into the polling stations; technology advanced dramatically and, with it, war became something in which there was little glory, only gore. Borden’s experience charts some of the nation’s changes. An imperialist at the start of the war, he emerged a nationalist. His quiet frustration with British commanders and the condescension they displayed toward the Canadian troops was certainly a factor. Westminster’s implicit belief that the colonies should contribute resources and men without strings attached was bearable when Britain looked effective and honourable. Thereafter — from 1916, at any rate — Borden became an increasingly vocal advocate for Canada’s place at the table of nations. In the spring of 1917, British Prime Minister David Lloyd George responded to Canadian complaints by including the Dominions (Newfoundland, Canada, South Africa, Australia, New Zealand) in the Imperial War Cabinet. Canada joined in the peace negotiations in Paris, although its presence was largely for show. Nevertheless, it was an important step along a road to greater autonomy, as was Borden’s successful plea to have Canada eligible for election to the council of the League of Nations. While this was unfolding, Borden embraced women’s suffrage, deficit spending, an interventionist role for government, and prohibition. These were extraordinary moves taken by a Conservative PM from whom one might not have imagined possible a decade earlier. Borden retired from office undefeated in 1920. Laurier died in office the year before. Both the Liberal and Conservative parties were thereafter headed by men who were much younger and whose feet were planted firmly in the 20th century. For two decades, however, Laurier and Borden had wrestled, in their own ways, with issues of nationalism and imperialism. The former was inclined to a nationaliste perspective but pronounced strongly (sometimes strategically) on the side of imperialism. The latter was a dyed-in-the-wool imperialist who became a champion of Canada as an autonomous nation. As the “short 20th century” opened and the modern era got more fully underway, the goalposts of Victorian and Edwardian Canada were not merely moved — they disappeared from view. The concept of “total war” encourages us to examine the various levels at which Canada experienced and was changed by the Great War. Mortality rates ran to more than 61,000 Canadians and Newfoundlanders. The federal state became more interventionist and directly involved in the economy. The war divided Canadian society in many ways but especially on the issue of conscription. Many values and relationships that were seemingly permanent before 1914 turned out to be changeable and, in some cases, disposable. CVA 99-1477 – [Cenotaph and Victory Square looking south] by Thompson Stuart / City of Vancouver Archives is in the public domain. 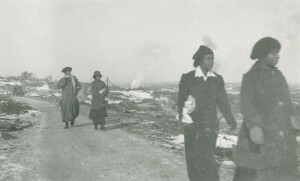 Women walking from Africville, 1917 by James & Son is in the public domain. with no known copyright restrictions. 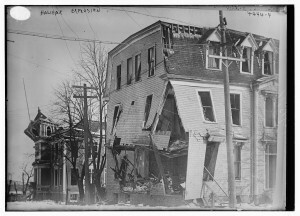 This image is available from the Nova Scotia Archives. 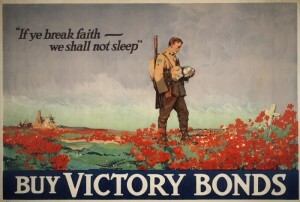 If ye break faith, we shall not sleep : buy victory bonds by John McCrae is in the public domain. This image is available from the Toronto Public Library under the call number 1914-18. Victory bonds. Item 1. L.
6.4 Assessing Canada’s War by John Douglas Belshaw is licensed under a Creative Commons Attribution 4.0 International License, except where otherwise noted.